The Cause of Labour Is The Cause of……. A key objective for the SNP over the last 20 years has been to replace the Labour Party as the dominant political party in Scotland. Various factors have assisted them in achieving that goal. Importantly the establishment of the Scottish parliament (by Labour) and then the introduction of a proportional voting system (by Labour) at local government elections. Politically the Blair years and all that went with that sickened many Labour voters In Scotland (and elsewhere). As Labour abandoned working class communities, not just politically but also physically on the ground, voters looked elsewhere. In England traditional Labour heartlands occasionally turned rightwards as the left has been unwilling to adapt to enable it to fill the vacuum in these communities. In Scotland the SNP have stepped in. Positioning themselves as more traditionally Labour than the Scottish Labour Party. The job is done. Labour’s hegemony in Scotland is over. The SNP are now the dominant force in Scottish politics. The gravitational pull that comes with being the party of government coupled with the power of patronage that comes with being the dominant political force is now firmly in the hands of the nationalists. The result is familiar. The careerists and opportunists that used to populate the Scottish Labour Party are now in the SNP. If you doubt that just ask yourself if you were motivated by self-advancement in politics would you join the Scottish Labour Party. See what I mean. Unlike many others I cannot blame Tony Blair for my dissatisfaction with Labour. Coming from the socialist republican tradition of James Connolly and John Maclean I’ve never bought into the British Labour movement narrative. This was a party which had no problem with the British state and in some instances argued the British state has been a force for good in the world. Irish republicans want to see the break-up of the state and view the British state as responsible for many of the problems in the world. For every historical reason posited for working class people to vote for Labour we could counter with a historical reason to do the opposite. Labour’s ideological retreat is not the result of Tony Blair and New Labour rather Tony Blair and New Labour were the result of Labour’s long ideological retreat and rightward drift. As is often the case the personal and the political collide. It was the Labour Party that banned the James Connolly march in Edinburgh back in 1992-93. Although instigated by the Orange Order and the Police, it was Labour who made the political decision to deny our community our right to assemble and freedom of speech. Although we defeated the ban it resulted in dozens of our members being arrested, some losing their jobs and others physically attacked by police officers. When I was eventually convicted of organising an illegal march (after we’d ignored the state ban) one of the state’s witnesses against me was a Labour councillor. I’ve never voted Labour in my life and I’ve shed no tears over the collapse of Labour support in Scotland. In short the Labour Party in Scotland are in many ways the authors of their own destruction. However it would be wrong to suggest this has just fell in the SNP’s lap, they have very skillfully maximised these political opportunities for their party. To replace Labour in their heartlands they have started preaching some of that Old Time Religion, or perhaps that should be Old Labour Religion, to Labour voters. I’ve called this manoeuvre the SNP Swerve. They are like a tricky winger moving at speed towards a defender. They drop their shoulder to go left and then, as the defender alters his position, they move back to the centre. Of course the SNP are not the first political party to campaign on the left then move back to the centre once elected. But the fact remains that for all their progressive rhetoric and nice smiles their actual record in Government is anything but progressive. In fact in eight years in Government they have not introduced one redistributive measure. Not one. An oft cited example of the SNP’s left wing credentials is their opposition to Trident. Of course opposition to Trident is a good thing. But let’s be clear the SNP are arguing to have Trident removed from Scotland while simultaneously arguing for an independent Scotland to join NATO, a nuclear alliance. So Trident is bad but nuclear armed NATO submarines in Scottish waters is good? Their opposition, like so much else, is based not on principle but opportunism. Ideologically promiscuous constitutional nationalists may be but that doesn’t make them the worst people in the world of course. I’ve known many SNP politicians for more than 20 years and several of them are perfectly decent people. I know many of their activists and know they are genuine in their desire to make this place better. Likewise I’ve met many Labour politicians and activists who work tirelessly for their communities. And it may well be that you live in an area where there is a republican, a socialist, or perhaps even a working class candidate that would be perfectly reasonable to vote for despite their respective party policies. Sadly in this constituency that is not the case. The incumbent Labour candidate is, even in a crowded field, one of the most obnoxious candidates in this election. She was heading to certain defeat even without the imminent SNP tsunami. Incredibly the SNP candidate is no better. One of the mysteries of this election is how, given it often seems like the whole country has joined the party, the SNP have managed to select such useless candidates? In this constituency the SNP chose a wealthy businessman who, having spent much of the last 40 years opposing independence (many of those as a Labour Party official), decided after the referendum that nationalism was the best solution for Scotland (and of course himself). 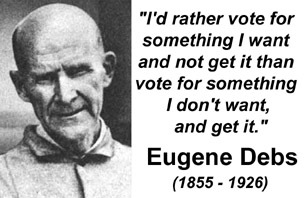 Eugene Debs was a socialist US Presidential candidate, Union leader, political prisoners and contemporary of James Connolly. Given the herd mentality that has developed around the SNP the presence of a few carpetbaggers is unlikely to deter their new found followers. It’s totally understandable that long time nationalists and perhaps even their new members should be swept along with the cheerleading. Less obvious is why leftists should become some of the loudest cheerleaders for a monarchist party who have turned support for British militarism into a fetish and buy into whacky right wing economic myths like the Laffer Curve. The collapse of the left in Scotland into left nationalism is one of the most remarkable referendum developments. The fact we predicted it gives us no satisfaction at all. After decades of defeats there is no doubt part of the motivation for many left wing activists is safety in numbers. Simply put they look overjoyed to be part of a crowd. Just delighted to be on the winning side. If the price of this new found popularity and social life is the ditching of political principle, so be it. Similarly any Irish republicans in Scotland voting (or joining) the SNP are just kidding themselves on. Not only for the reasons above but because this is the party whose single police force, the Met of the North, and the Offensive Behaviour Act have been used relentlessly to target our politics and our history. Many of these people were, rightly, outraged when Martin McGuinness met Betty Battenburg. It is absurd that these same people can now be voting for an openly, and enthusiastically, monarchist party. This is not serious politics. For republicans or leftists to park their critical faculties in search of a small niche within nationalism is the road to ruin. Any short term gain, will inevitably be followed by long term pain. All of this might seem like the ruminations and observations of an old misery guts. Someone just unable to recognise the transformed political landscape. In other words someone who should just shut up and vote SNP. Well, if I wanted to take the path of least resistance in politics I would not be an Irish republican in Scotland. Having opinions which are inimical to our personal interests are just par for the course. Solace comes in finding some comfort in uncomfortable truths. Politics is about so much more than elections. In many ways I feel deeply frustrated being unable to actively support (never mind vote for) a working class, left candidate. Like many on the left, Irish republicans have suffered enough defeats to have long abandoned any notions of absolutism. Our idealism beaten out of us by the hard knocks of realpolitik. We long since realised that life is not as simple as we once believed. And with that realisation came an acceptance that politicians, like the rest of us, are deeply flawed. It also brought a recognition that the path we have been on for the last 30 years contained many signs we mistook for directions when in fact they were warnings. Working class people need to be better represented, that much is true. To be effective that representation must be authentic, based on an understanding that the current economic system is built on exploitation. We need representatives prepared to challenge privilege and state ideology. Political principles do matter. Settling for, or recommending the least worst option is not the answer to anything. It just encourages the parties to continue to shaft us. Investing all your energies and hopes in the SNP or the Labour Party is ultimately a fool’s errand. These parties do not represent me, they do not represent my class and they never will. 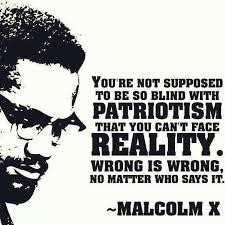 And no amount of flag waving, spin, face paint or delusion will alter that fact.